SoFi started in 2011 and is a lending company that recently surpassed $15B in funded loans as of 2017. They have 225,000+ customers, 240 employees and have raised $1.9 B in equity funding after raising $500M led by Silver Lake in February 2017. The company was founded by Mike Cagney, Dan Macklin, James Finnigan and Ian Brady, four students who met at the Stanford Graduate School of Business. They got together because they wanted to make lending and refinancing easier for borrowers using social lending. The gist of their business is that lenders are willing to lend at a lower rate to people similar to themselves versus complete strangers. In other words, alumni should be more willing to lend to students and fellow grads of their alma matter because they share the same educational qualifications and should have a strong likelihood of repaying their loans. SoFi is considered the largest and most successful fintech lender today. They are based right here in San Francisco, and I’ve met many of their employees. 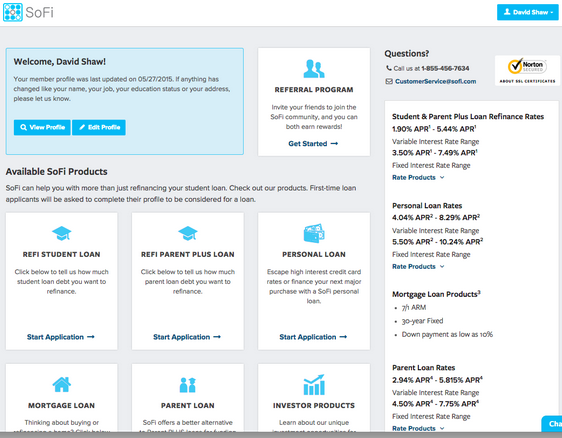 It’s worth checking to see if you can get a lower student loan rate with SoFi. The cost is free. Description: Social Finance (SoFi) is a finance company that offers a range of lending and wealth management services. The company primarily caters to early-stage professionals and offers variable and fixed rate parent, personal, mortgage refinancing, and more. On Feb 24, 2017, a $500M Series F funding round was announced led by Silver Lake. What I found most intriguing about SoFi’s student loan refinance program is that it has this great unemployment benefit clause where it will pause your debt repayment schedule if you lose your job. Interest will still accrue while you are looking for work, but at least you’re saving some cash flow when you need it most. Now that’s some pretty good unemployment insurance! SoFi also offers other benefits that traditional lenders don’t. For example, career advising, networking events (which I’ve attended), and entrepreneurial support to help borrowers achieve financial and professional success. To date, SoFi has helped about 70 SoFi members secure new jobs through its Job Search. Another 30 have gone through their Entrepreneur Program. 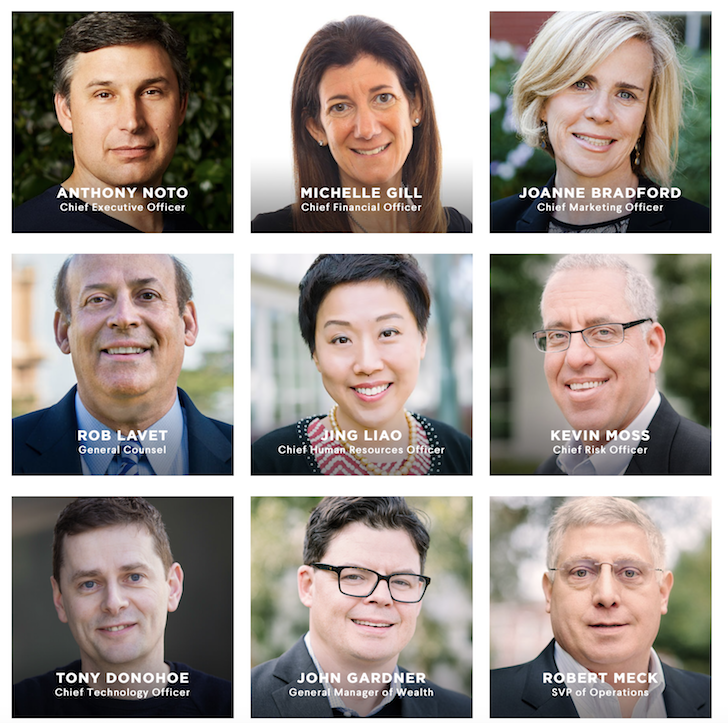 Participants from SoFi’s first two classes boast two acquisitions, one merger and several rounds of multi-million dollar funding. What I really like about SoFi is that their underwriting process takes into account merit, education, and quality of employment history, in addition to the traditional income, credit score, and existing debt levels assessed by traditional banks. I firmly believe that if I went through SoFi’s mortgage refinance process back in early 2015 when the 10-year yield was at 1.68%, my refi would have passed. * Can refinance both private and public student loans. You can apply to refinance a student loan here. You can apply to consolidate your high interest rate loans here. 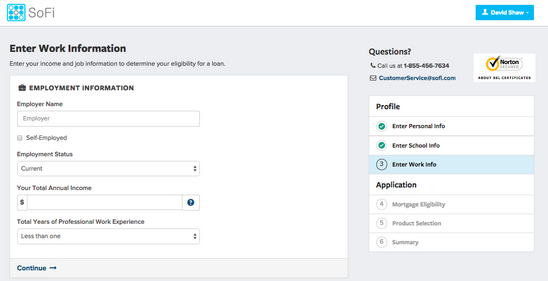 Here are a few snapshots to show you what the application process looks like for borrowers on SoFi. It’s all very straightforward and doesn’t take that long to complete. Everybody who has a student loan or high interest personal loan should get a quote from SoFi to see if you can refinance your existing rates. Click here to get lower rates on your student loans. It’s all about leveraging technology and the massive amount of funding SoFi has garnered ($2B) to take advantage of lower rates. About the Author: Sam began investing his own money ever since he opened an online brokerage account in 1995. Sam loved investing so much that he decided to make a career out of investing by spending the next 13 years after college working at two of the leading financial service firms in the world. During this time, Sam received his MBA from UC Berkeley with a focus on finance and real estate. He also became Series 7 and Series 63 registered. In 2012, Sam was able to retire at the age of 34 largely due to his investments that now generate roughly $200,000 a year in passive income. He spends time playing tennis, hanging out with family, consulting for leading fintech companies and writing online to help others achieve financial freedom. About Financial Samurai: FinancialSamurai.com was started in 2009 and is one of the most trusted personal finance sites today with over 1 million organic pageviews a month. Financial Samurai has been featured in top publications such as the LA Times, The Chicago Tribune, Bloomberg and The Wall Street Journal. Hi, Sam. My name is Sam, too (Samantha). I write this out of desperation. I’m a law school student with $130K in student debt from my undergrad studies. Being none the wiser at 18 years old(and being a first-generation college student), I selected variable interest rates for my Sallie Mae loans – all of which are now exceeding 10% interest rates – and are accruing interest quickly. Over $20k of the aforementioned $130K total owed represents interest accrued. The student loan debt crisis is completely out of hand and it’s very unnerving to think about myself being crippled by this debt. So, I’m looking for help and advice – what do I do? Is there a way that I can refinance while still deferring until I’m done with law school? Hi Samantha, it seems dire while you are in school and not earning any money. But once you start earning some money, you can Chip away at your loans, And it won’t seem as bad. If it’s possible to work side jobs now to reduce the debt, that would be good. Definitely look to try and refinance to the lowest rate possible. Can a SoFi personal loan be used for real estate? Or is that non permissible? Does anyone know? Just confirming a couple things-when refinancing student loans through SoFi, it still counts as student loan interest payments for tax purposes, correct? The only thing I’ve worried about is if the goverment views this as a personal loan instead of a student loan. Thanks! Yes, still a student loan. Interest can be written off provided you make less than a certain amount of income. Sofi did no live up to the promises in the marketing material that I received. The ad stated that their rates were as low as 3.245%, 10 % down with no PMI. Subsequent to completing the application and submitting all of the requested material, I was informed that I would get a rate between 4.5 % and 5.5 %. I was shocked because my credit scores are in the low 800s and high 700s, which should qualify me for the lowest rate possibly. I was able to secure a mortgage with another company for rate of 3.625% with 10% down and no PMI. Maybe Sofi is good for student loans, personal loans or for people with bad credit, but I would suggest that you use someone else if you have good credit and are looking for a mortgage. I started off with over $30,000 in student loan debt with an 8.5 interest rate. With roughly an upper 600s credit score. Sofi refinanced my loan to be 6.5% for ten years saving me around $15,000. I refinanced the same loan with them again to get a lower rate and now I am at 5.99% for 7 years which shaves off another $3,000. My credit scores wasn’t any better when I applied for the second refinance but sofi looks at various factors in order to give you the best rates possible. Applying with SoFi was the best decision I ever made in 2015. Plus the customer service is awesome. I think you’ll find this VERY interesting. I’ve been trying to get a primary mortgage through SoFi, and they are refusing to count my income because — you guessed it — I’m a freelancer and have less than two years of tax returns for my business. My credit score is above 800 and my employment history goes back 10 years. I’m making more now than I was at any of my salaried jobs. I have immaculate accounting records, can show proof of retainers, big contracts, etc, but they won’t consider my income for a loan. I was hoping SoFi would be different than traditional banks, and maybe they are for loan products other than mortgages. But in my specific experience, they have been just as conservative as any other lender. It’s been very disappointing. Fortunately, we’re buying a small property well within our means, so we can qualify for the house based on my partner’s income. But it still feels insulting that my income cannot be considered for the purchase. How bout just pay off the mortgage? You said you have the cash. That would be a 0.0% interest rate. Cash management and liquidity. If I had an extra million liquid or semi liquid, I would probably just pay it all off. Everybody needs to be careful not to be too house rich, cash poor. I refinanced my JD/MBA student loans with SoFi a year and a half ago while working abroad in Asia. It was a relatively easy process. I was happy to jump through a few hoops to take my interest rate down to 2.8%. (Prior to the refi, my PLUS loans carried rates as high as 8.5%!) TruStudent, SoFi’s servicer at time of my refi, had a clunky website, but that was fixed when SoFi recently (and seamlessly) moved to MOHELA. I make additional principal payments each month and SoFi has correspondingly reduced my minimum monthly payment amount. I appreciate this because while I plan to pay my loan off early, I always like to be prepared for a sudden reduction in cash flow. Dang, 8.5% to 2.8% is awesome! How did it get to 8.5% in the first place though? Seems like the PLUS system is kinda taking advantage of students. I’ve been a borrower since 2013 and I honestly can’t say enough about how wonderful SoFi is. After graduating from Northwestern, I had loans on top of loans. At first, I just paid the minimum monthly balance and I thought I was making progress (remember I had just graduated from college and I was not the least bit financially savvy.) Then I got my first real job and my sister gave me a Suze Orman book as a present (or a hint) and that’s when I started looking more closely at my loans and their interest rates. 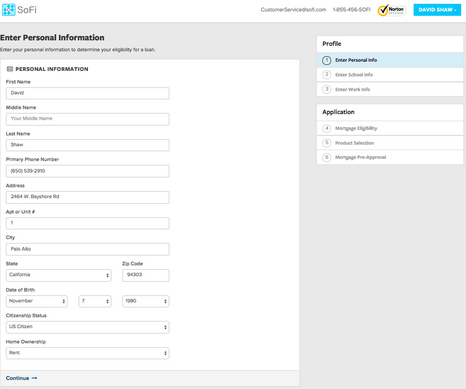 A quick web form and a few uploaded screenshots later and I had applied for SoFi to refinance my beastly loans. The hardest part of their application process was getting loan payoff amounts from my other lenders. I qualified despite not having a massive income or a perfect credit score (remember, I was a recent college grad) because as FS noted, they look at you holistically. FS is lucky to not have lingering student loans. I am very lucky I found SoFi. Glad you were able to refi down from 9.75% and the experience was good. That is a high rate! It is good they looked at you holistically, and are “betting” on you as you go through an upswing in your career and earnings power. It makes sense. How do you get to be a lender rather than a borrower under their plan? Do you have to be an accredited investor or is it invitation only via the alumni association of the respective institutions? I like what they are doing but a bit worried they will be forced to follow current rules in the system or are/will be just another front-end and will sell off mortgages such a traditional lender would do. Having enough capital to hold them all on the books may not be possible. If they can do truly unique underwriting where a human is actually making a decision, that will be a game changer. I’m just not sure in this day and age it is possible. We almost need to take a step back to the times of our grandparents where you knew your banker and he could do things for you. I’m afraid this only exists today for the people who don’t need to borrow in the first place. I’ve spoken with a few people who were unable to get a better rate on a MBA loan refi. Why do you think a lender selling off their loans to the secondary market is bad? I think consumers still have several a years before fintech gets so over regulated that the benefits become too small to notice. Maybe the big banks will just start acquiring to the fintech company’s delight. I should clarify, I think it’s bad if they are just a front-end to the existing secondary market with a fintech marketing angle. (If Sofi loans start showing up in other issuers securitizations so sofi underwrites to their rules without thinking independently) Doing their own securitizations is a good thing and their student loan deals have had few if any defaults. I think the investors have been quite happy. I’m just hoping they do as much as possible to separate themselves from the existing machine and the costs imposed by it. underwriting costs/ ratings agencies etc. Selling off their loans is necessary as they can then make more loans, although I do think there’s a solid argument that those making the loans should keep some skin in the game. Hopefully, they’ll hold the equity/residuals internally which should be good for Sofi investors and make any investment in Sofi more interesting. I hear you about getting a mortgage/refi from a major bank. The last time I refinanced was in 2013, and I had to yell at the loan expediter to get them to start the underwriting process after waiting 90 days after the application was submitted. I think you’re missing a big point about the banks not approving loans, however. The reasons they give to us about not approving loans are their “rules” about employment length, etc., but that may not be the actual reason they’re not approving the loan. In my case, we were refinancing down to a lower percentage, with a significantly smaller principal amount and they were giving us the same story about all of the documentation they needed for “new regulations”. This is true, the regulations are changing all the time and requiring stricter documentation. However, the decision on whether to fund the loan is still completely in the hands of the underwriter at the bank, not due to any regulatory control or to specific rules in place. The underwriter decides based on whether the loan will be profitable or not for the bank to offer (and subsequently re-sell the loan at a later point to another lender). If the bank determines that it’s ultimately not worth it due to low interest or better refinancing terms, then they can give whatever reason they want due to the many “rules” to deny the loan. My guess is that Chase determined they weren’t going to make enough profit on your loan (maybe you have a history of paying down principal early? )… and that is probably the ultimate reason for rejection, regardless of what they told you. I’m glad to see there is real competition in the lending space with offers of better terms and better products. It’s been too long that banks were the only viable lending game in town. It’s only through this type of competition will banks start to offer better terms and better deals. This seems like it violates fair lending laws. I think regulators might look the other way for a little while, but I don’t think the model is sustainable. Unlike say uber, where taxi laws are generally unpopular, things like fair lending laws are widely supported. Generally speaking, data points like education, college major or institution, or other subjective non-financial factors are not used in mortgage lending decisions as they create disparate impact (i.e. negative impact on a protected group). For example, two candidates with comparable income profiles apply for a mortgage. One has a degree and is accepted; one does not and is rejected. Fair lending laws are in place to prevent lenders from being able to make these decisions based on subjective factors because, for example, veterans (a protected group) disproportionately don’t have degrees compared to their income bracket. Lending related to home mortgages is highly regulated, due to the fact that it’s considered closely tied to equal housing opportunities. Regarding background, I’m a CPA and advise several major financial institutions on a variety of regulatory risk issues. I’ve been involved in multiple fair lending compliance audits. Any word on whether Sofi or other Fintech companies may be looking to expand into mortgages for investment properties? B2R financing is interesting, and good competition for commercial loans, but still really high rates compared to rates on conventional loans for investment properties. There seems to be an opportunity for a company like Sofi to apply such a merit based approach to portfolio style lending beyond Fannie Mae’s 10 loan limit. Evaluating an investors cash flow, performance history, capital reserves, etc as opposed to the strict Debt / Income ratios and such imposed on conventional loans. SoFi reminds me a bit of P2P lending, going by your writeup, but going well beyond the personal unsecured loan. Helping people refinance their high yield student loan debt is something that can both do a lot of good and make the company a lot of money. And those personal loan rates. Even better than Lending Club and Prosper. I wonder how their underwriting guidelines compare? One concept I really do like is the unemployment benefit. The idea that your repayment schedule stops if you lose your job? Jamie Dimon would probably have a heart attack if someone suggested that. As for the big banks, it’s very frustrating. They did a huge 180 after the Financial Collapse. In 2007, they would lend to anyone with a pulse. Today they would probably deny Warren Buffett a loan. I do so many applications for personal loans and Home Equities, and rarely does anything get approved. Jamie and his new billion net worth. Paul Blankfein too. Dang the CEOs get paid so much. The difference between the likes of SoFi and P2P lending is that SoFi is the lender, where’s in P2P, you and I are the lender. We can’t lend on the SoFi platform unless we invest in the company. Hence, SoFi is all for the retail borrower. 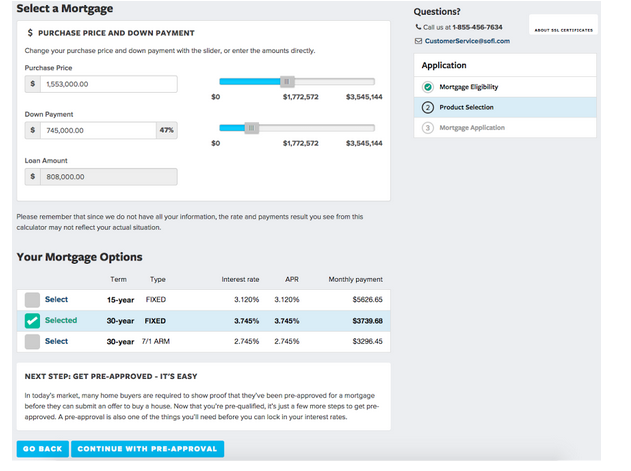 I was interested in SoFi for a mortgage because you can do a 10% down mortgage with no PMI. But to insure themselves, the interest is significantly higher on 10% loans with SoFi for people who aren’t high income, in spite of credit worthiness. I understand the reasoning, especially since they don’t have to follow bank rules yet, but a difference of 2% was not worth keeping more down payment money as a cushion with SoFi. I ended up using USAA instead and 20% down. At the end of the day, it’s all about the rate + your liquidity need. I most certainly would have gone with a 2% lower rate, that spread is too wide. If the spread was only 0.5% to maybe 1%, I may have gone with SoFi. So long as you don’t have to pay PMI, that is important. What an unnecessary expense! 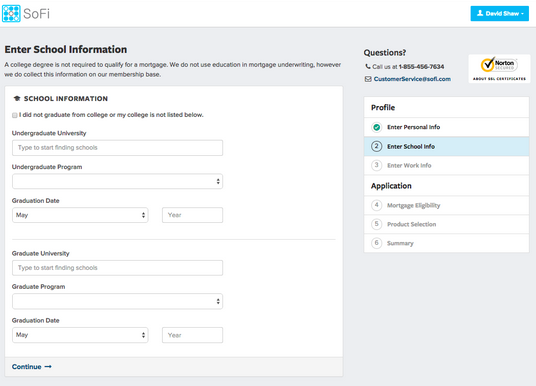 Getting qualified candidates based on SoFi’s underwriting system in for 10% mortgages w/ no PMI could be a game changer, especially for expensive housing markets. I actually just finished refinancing my high rate student loans last week. I ended up going with another fintech company and not SoFi, but the process was very easy with both. It’s great that these companies provide an option for people who would otherwise get rejected from a big bank for some obscure reason. Nice job refinancing! What interest rate were you able to get? I went through SoFi for my student loans for medical school and the process was very straightforward (although it did require a lot of documents). I ended up going with DRB instead, only because they offered me a better rate. I did ask SoFi if they could match the DRB offer and unfortunately, they could not. I’ve been hearing SoFi advertise on Pandora a lot. With their latest fund raising, they seem well equipped to grow and offer discount rates. I do wonder whether the government and banks will become more competitive and offer lower rates as well. But, given it’s the government and big organizations, they can’t be as nimble. 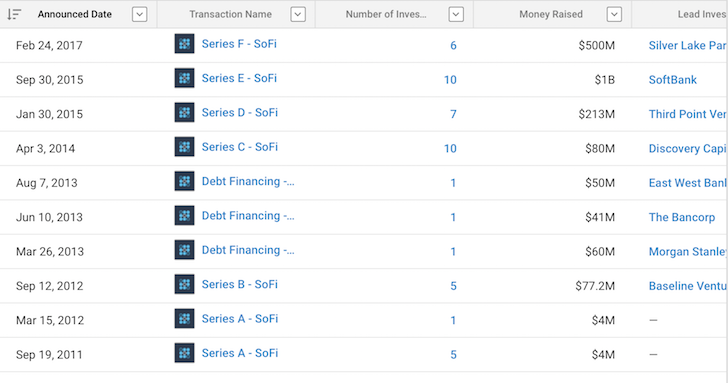 If SoFi goes public, do their loans get more scrutinized though? Probably. My hope is that fintech lenders like SoFi, and the whole fintech industry puts positive pressure on big banks to be more efficient, lower prices, and offer better products. I was hopeful Zillow, Trulia, and Redfin would finally crush the 5% selling commission rate… but so far… 5+ years later, they haven’t. Fascinating. I’ve heard of SoFi, but I had no idea about their core service offering of alumni offering student loans to fellow alumni. I can definitely see the appeal and trust involved. I totally agree that the refinance process with big banks is one big giant headache. It’s good to hear there are much more user-friendly and out of the box options like SoFi for consumers to choose from now. I love fintech! *To protect the innocent (and perhaps not so innocent), I have used a new name today. I actually am very familiar with the firm. They started as a peer-to-peer lending group and morphed into the student loan refinancing firm they are now. They intend to move into mortgages, etc. They are not a bank and do not have to follow bank rules, so they can essentially segregate the market and give loans at preferential rates to the top tier of student refinancers – they started marketing to top business schools and are expanding to other schools at their discretion. They do look at your resume and are small enough that they are able to actually qualify each client based on their school, grades and work history, etc. Banks will eventually probably create ventures that compete, but they cannot do it under current rules. I attended a pitch session once – I was very impressed by the pitches of the clients – about 6 or so over lunch (clients were the loan refinancers aka new grads, mostly from top business schools). And the investors that were present were SoFi’s own investors, and represent extremely well-known VC firms. I think refinancing with SoFi, if you qualify for the best terms, is a no-brainer. SoFi reminds me a bit of Uber – they were able to find a way to go around established rules that govern a slightly different type of business (banks). If you can do it, do it! This is very interesting. I think it is just another example of a very fragmented, decentralized economy forming before our eyes. It’s kind of exciting. I think these giant banks are simply getting too big to make decisions based on nothing but strict data constraints. They are too big to take advantage of common sense sometimes. I think we’ll see this sort of thing pop up in more and more places as the bigger institutions fail to react to changing times.